On March 3, 2015, the legendary music director who is surprisingly not that well-known, Ravi, would have turned 89. And March 7, 2015 marked his third death anniversary. Surprising because so many of his songs are popular to this date – used in jingles, remixes and what not. For example – Ae meri zohra jabeen or Baar Baar Dekho. Ravi, born as Ravi Shankar Sharma in Delhi, was a versatile composer who could compose any type of song – be it romantic (Yeh Hawa yeh Nadi Ka Kinara from Ghar Sansar), or zany (CAT CAT Mane billi), poignant (Babul Ki duayen leti ja) or even bhajans. He learnt bhajans from his father and was the lead singer of a bhajan mandali. Even though he was encouraged to go to Bombay (his voice was like that of Rafi), Ravi was hesitant to leave his job at Post and Telegraph Department. In 1949, at 23, he decided to try his luck in Bombay. Hemant Kumar took him under his wings and Ravi worked as his assistant for a while. 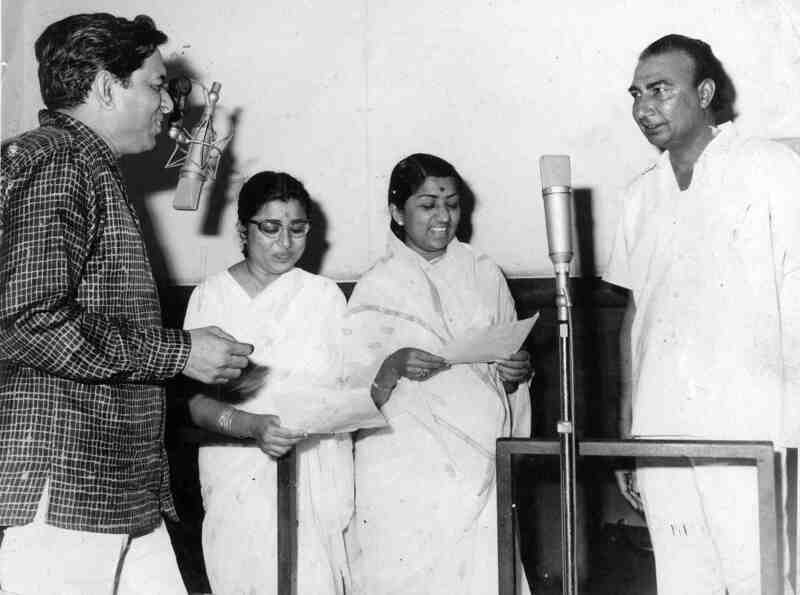 Ravi was a part of the chorus that provided vocals in the song Vande Mataram. Hemant Kumar encouraged Ravi to make his debut as an independent music director. He recorded his first song for the 1955 Devender Goel film, Vachan. Besides establishing himself as a talented composer in Hindi cinema, he made a name for himself in the Malayalam film industry where he was known as Bombay Ravi. I have gone on and on about my favourite lyricist, Sahir Ludhianvi on this blog earlier. And March 8th, 2015 happens to be his 94th birth anniversary. Incidentally, Sahir Ludhianvi and Ravi worked together in almost 19 films and created some wonderful songs. So as a tribute to both of them, here is a list of my favourite songs, penned by Sahir and set to music by Ravi. Coming back to Chalo Ek Baar, Sahir is said to have written this as a poem for Sudha Malhotra, when they could not marry. Picturised on the droolworthy Sunil Dutt, with Mala Sinha and Ashok Kumar, this song is a tragic one. He is a guest playing the piano and entertaining his host (Ashok Kumar) and hostess (Mala Sinha) with a song – On the surface, it starts off like that but there is the hopelessness of the situation. He loves the hostess, who reciprocates too, but is now married to another man, who is suspicious. The song is infused with a loneliness, a sadness at the situation – he cannot forget her, and cannot move on but has to. There is pain, anguish, passion and loneliness all wrapped brilliantly. 2) Tum Agar Saath Dene ka Waada Karo (Humraaz, 1967, Mahendra Kapoor): Another delightful number from the same camp. Humraaz was an interesting, suspense B.R. Chopra movie starring Sunil Dutt, a frightfully wooden Vimi and Raj Kumar. Mahendra Kapoor gets to sing some very nice numbers – Neele Gagan ke tale, Na munh Chhupa ke jiyo and Kisi Patthar ki moorat se mohabbat ka iraada hai. This particular song is romantic, melodious and beautiful. The words are romantic, the music soothing and the singing infused with just the right amount of love, teasing and affection. 3) Jiyo Toh Aise Jiyo (Bahu Beti, 1965, Mohd Rafi): Moving on to a sweet song picturised on Joy Mukherjee and Mala Sinha. This song is optimistic and philosophical and inspiring. I haven’t seen the movie but it looks like Joy Mukherjee is encouraging Mala Sinha and lift her spirits. I was torn between this song and the melodious Mahendra Kapoor-Asha Bhosle duet Rangeen Fiza hai but picked this because of Rafi’s flawless rendition. 4) Yeh Wadiyan Yeh Fizayen bula rahi hai (Aaj aur Kal, 1963, Rafi): Another lovely lovely number sung by Rafi. Nanda plays a wheelchair-confined, depressed princess and Sunil Dutt is the sensitive, young doctor who is here to cure her. In this wonderful, romantic song, there is a lot of affection as he gently tries to get her out of the wheelchair. He praises her, assures her and encourages her to get up. The music is lilting; the words and singing (by the peerless Rafi) are magical. 5) Tora Man darpan kehlaye (Kaajal, 1965, Asha Bhosle): Ravi started off as a bhajan singer, so it is not surprising that he did compose some lovely bhajans in his movies. This is one such number. Sahir Ludhianvi, the ever intellectual poet and philosopher has penned some of the finest bhajans in Hindi cinema (Allah tero Naam, Prabhu tero naam and Hey rom rom mein basne wale (another from the same duo)) . This is yet another. Sung beautifully by Asha Bhosle, this song is spiritual, devotional and exceptionally meaningful. The focus of this bhajan (as most of Sahir’s other bhajans) is not so much the deity but the individual, his faith and conscience. 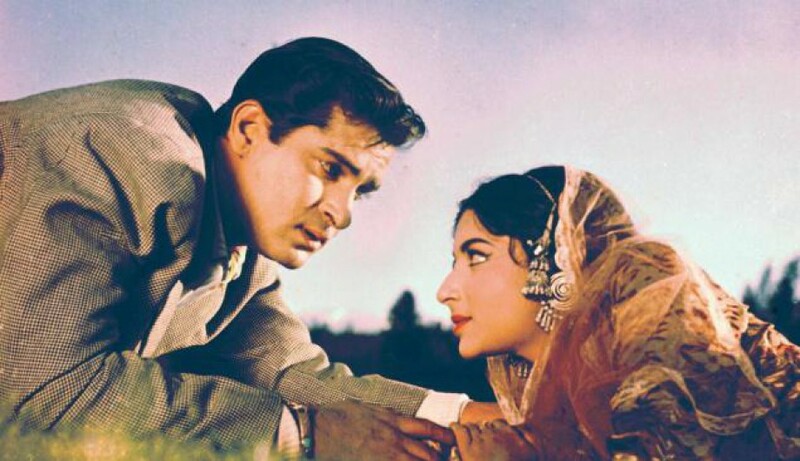 6) Zindagi Ittefaq Hai (Aadmi Aur Insaan, 1969, Asha Bhosle): Now this was a tough choice. This Yash Chopra movie (from the B.R. Chopra stable, probably the last movie together after which Yash Chopra branched out) starred Dharmendra, Saira Banu, Feroz Khan and a gorgeous Mumtaz. It had excellent songs – be it this one, or Zindagi ke rang kayi re or the two fantastic Asha- MK duets, the fast paced, lilting O Neele Parbaton ki Dhaara and the soft, melodious Ijaazat Ho. After much debating, decided to pick this one. It is an out and out Western tune, sung superbly and seductively by Asha picturised on a lovely Mumtaz. The lyrics are contemplative and philosophical and typically Sahir. There is a duet version sung by Asha and Mahendra Kapoor and the embedded video has both the versions. 7) Door Rehkar Na karo baat kareeb aa jao (Amaanat, 1977, Rafi): Manoj Kumar is not one of my favourites as such, but I like him in his pre-Bharat phase. And two of my favourite romantic numbers (both sung divinely by Rafi) are filmed on him. Tum poochte ho Ishq bala hai ki nahin (Nakli Nawab) is one and this is the other. This is a passionate, romantic number – the lyrics simple and evocative, music very soft and melodious and the singing simply divine! Lovely. 8) Milti hai zindagi mein mohabbat kabhi (Aankhen, 1968, Lata Mangeshkar): Okay the context of the song is a bit weird. Mala Sinha’s half-Indian, half-Japanese character stalks poor Dharmendra as she has fallen in love with him (She even gets a job at the post office so that she can read his mail and be informed about him!) Yes, she is completely determined to win him over. And is singing about her love for him. But what a beautiful song, this is! Maybe thats why he is just reluctant and not creeped out, despite the blatant stalking. 9) Dil mein kisi ke pyar ka jalta hua diya (Ek Mahal Hai Sapnon Ka, 1975, Lata Mangeshkar/ Kishore Kumar): Another song from the 70’s. The lyrics of this song are simply outstanding. The male version is sentimental and a tad bit philosophical – as Dharmendra remembers his lady love Sharmila, who is now married to someone else. The female version of this song is picturised on a pretty Leena Chandarvarkar, who has fallen for Dharmendra, and is trying to playfully getting his attention by singing this song. The tune is melodious and the singing just adequate, but in my opinion, its the lyrics that make this song stand out. 10) Aage bhi jaane na tu (Waqt, 1965, Asha Bhosle): This is an all-time favourite which has a habit of creeping into each and every list. A stylish song with a Western influence, this has been sung brilliantly by Asha Bhosle. This score is filled with fantastic numbers, be it Kaun aaya ki nigahon mein, or Ae meri zohrajabeen or the delightful duets Hum jab bhi simatke aapke or Din hai bahaar ke. But this one tops my list of favourites – as the story moves along fantastically as the song progresses! Sahir’s philosophy of life comes through, (as it does in several other songs) – fatalistic, as the emphasis is on the now and the present. Mesmerising. 11) Sansaar ki shae ka itna fasaana hai (Dhund, 1973, Mahendra Kapoor): Ending the list with another Mahendra Kapoor-Sahir-Ravi song from a B.R. Chopra movie. Again, a favourite, much loved and listed here, this song stands out for its fabulous lyrics – echoing the philosophy of Carpe diem / living in the moment, just like Aage bhi jaane na tu. This entry was posted in Old Hindi songs and tagged Asha Bhosle, Ashok Kumar, B.R.Chopra, Dharmendra, Kishore Kumar, Lata Mangeshkar, Mahendra Kapoor, Manoj Kumar, Mohd. Rafi, Mumtaz, Raj Kumar, Ravi, Sahir Ludhianvi, Saira Banu, Sunil Dutt, Vimi, Yash Chopra. Bookmark the permalink. Ah,nice. 🙂 Chalo ik baar phir se is a perennial favourite. Here are some of my favourite from their collaboration. And the reason I did not include Babul ki duayen leti ja was precisely because of the same reason- it moves me to tears! A good write-up and a deserving tribute. The additions are even more impressive and testimony to the versatility of all the three. Thanks, Madhu 🙂 The Sahir-Ravi collaboration did result in such lovely songs, didn’t they? As for Aage bhi jaane na tu, I think if i were asked to name ONE song that I absolutely love from all the songs, this probably would be it. It is such a wonderful song, really. Aa bhi jaa is indeed haunting and wonderful, indeed but I cannot think beyond Chalo Ek Baar, if we are talking about Gumraah 🙂 Making lists is so painful, is it not? I spend a lot of time wondering which to include and which not…. So many gems to pick from. This is a very good list. Ravi-Sahir make me think of Gumrah, Hamraaz and Waqt, invariably. Poor Vimi is always called wooden. Its the truth of course, but I feel kind of bad for her, the way her story ended. Hi Ava, Thank you. :) Oh yes, the songs of those three movies were simply superb. Hmm, Vimi was very wooden. But yes, her end was very tragic. Sad, really. Pingback: Carnival of Blogs on Golden Era of Hindi Film Music – March, 2015 edition | The world is too small? or Is it?